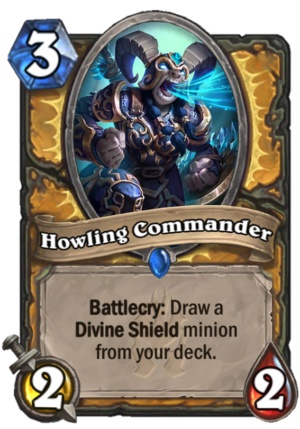 Howling Commander is a 3 Mana Cost Rare Paladin Minion card from the Knights of the Frozen Throne set! Battlecry: Draw a Divine Shield minion from your deck. Enlistment in her battalion comes with several pairs of earplugs. 3 mana 2/2 Draw Tirion. Entire set is not out and everyone is judging each card like crazy already. Remember when everyone was saying that the Rouge Quest was the worst then it turned out it was one of the 2-3 best overall next to the Warrior Quest and Shaman Quest. The problem is this is a value card that you don’t want to slam on 3 but it turns into a patches in hand once you naturally draw your Tirion. This is the worst card of the set. 3 mana 2/2 and draw a specific card. Just terrible. It only becomes good when they print a 4 mana exodia with Devine shield. I think there will be one overpowered card that you can draw with this because the paladin cards ATM look very week compared to the other cards. It makes no sense otherwise. So brace yourself for something so overpowered you want to put this rubbish into your deck. is….is tirion fordring not enough of an overpowered divine shield minion? Just a quick look at the front page of this sight shows he’s still a staple of paladin decks. guaranteeing him seems pretty good. I’m not sure why so many people are sh!tting on this card. So what if it doesn’t have the best stats? The fact that you’re searching for a very specific card is always a good mechanic since you’re not drawing something that is random out of your deck. A lot of you guys seem to forget as well, Paladin still has buff mechanics for cards in hand, so it doesn’t have to be a 2/2 draw a card. Agreed. The tutoring ability necessitates it being understated (which makes it crazy that Arcanologist isn’t). There’s a big difference between a draw and a controlled draw. Like you said, it fits well in a Paladin Handbuff deck where Wickerflame Burnbristle is one of the best cards to buff. If that deck and/or the Divine Shield synergies get more support, it could see play. This card ATM is very terrible and you wouldn’t play it in constructed. And if you think, that you were clever if this card will actually see play you are not, because most likely they will add a very overpowered card with Devine shield you want to draw with this card. And I am very sure there will be an overpowered card, because paladin could otherwise not compete to the slightest with the other new class cards released so far. But is 3 mana 2/2 Battle Cry: Draw your Tirion Fordring good enough for any deck? Yes, every paladin deck. The question is is it still good if you run the risk of drawing Tirion first. The worst card so far. If it would be a 3/3 or would have divine shield than it would be good. Mage gets a 3/4 draw a card …so that’s fair. Also why would I use this card over stonehill defender which has better stats + taunt and discovers me a card. Well it’s ONE of the worst not the worst card so far. This card is such an awesome searcher card…. Even if you aren’t playing divine shield paladin! Just put a Tirion or / and Wickerflame Burnbreasts in your deck and there you have it! …Why the hell would you want to draw Tirion from your deck on turn 3? Why not just run Loot Hoarder and get something you can potentially use? Or Stonehill Defender for a chance at a second Tirion? Unless there’s a specific Divine Shield combo deck, I really can’t see a use for this card. It is not because when you draw tirion you can’t play him that turn. Stonehill defender also gets you tirion, but an extra one and it has better stats and taunt. 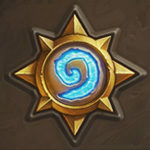 Agreed – I’d rather have Stonehill Defender in the 3-slot with a good shot to Discover a strong Paladin class Taunt – and a lot of them have Divine Shield anyway. This card is okay but nothing you’d want to play the divine shield deck seems to be something that would be more aggressively build and this card is very bad tempo as its body is small. Is…is this good? In a game where Loot Horder exists, I don’t know why I’d pay 1 extra mana for a single stat and a battlecry instead of deathrattle. Unless you’re playing a very specific combo deck where this can tutor a piece, I’m not feeling it. You pay 3 mana for a 2/2 that draws you a Card. Mages get a 2 mana 2/3 that does the same. Quite good I’d say… 3 mana 2/2 is decent since you draw a card. Paladin doesn’t have many good 3-drops. And drawing Tirion can sometimes be crucial (although I think Tirion doesn’t have the same impact like it had in the past). If divine shield deck is a thing then this card will definitely be played. Battlecry: Transform this minion into a random 7-drop. Your opponent removes devolve from his/her hand. Every Minion has this effect…. So pls…. Sorry sorry my bad o knowledgeable one, I’ll stop [not offending anybody] on a forum. This is going to be very strong. Cards like mad scientist and archonologist were very powerful. They only got you a secret. This can get you a minion which in most cases is way better than a secret. Probably not great for arena. For constructed i can see the potential but I feel like the stats are very underpower for the mana cost. It will be a must include for the “divine shield” deck. 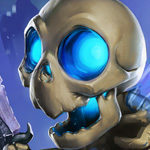 If they release a crazy 4 mana divine shield minion then its basically game over. 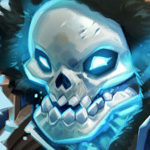 Corpse taker didn’t “have” divine shield. It woundn’t take her out of your deck becuse she gets divin shield from her battle cry.